Pros: Clocked at 3000Mhz after XMP 2 on Asrock x370 Pro4. Ryzen 7 1700, 3.8Ghz @1.25v. Build quality is pretty good too, the color is a darker color than shown but its a really nice red. Other Thoughts: Not a con, but on the Asrock x370 Pro4 requires these to run in A2 and B2 for 3000Mhz. They were only hitting 2400Mhz in A1 and A2. Pros: Looks very cool and is working well with my Ryzen 2600X and AsRock B450M Pro4 motherboard. The motherboard autodetected the ram and created an XMP profile for it to activate DDR4-3000 instead of the default 2133. Pros: This is usually great memory. Cons: Purchased 12 since first of the year and 3 were bad within 48 hours. Even one of the RMA replacements was bad. Must be a bad batch. Other Thoughts: After this batch is gone and Newegg receives a new batch. I would recommend. We are sorry to hear you had such issues. There should not be any bad batch, but if you feel any modules are not working properly, feel free to send them in directly to G.Skill for RMA exchange. Replacement kits direct from G.Skill should work flawlessly. Visit the G.Skill website for complete RMA procedure. For any questions or concerns, please feel free to contact us directly. Pros: Seems compatible with Ryzen 5 2400G and Asus Prime and was able to run at the rated speed. Cons: One of the pair starts to cause Win 10 BSOD with memory error after two days. Failed Windows memory test and MEMTEST86. The memory was nit OC beyond the rated frequency and when BSOD appears, I tried to lower the speed to 2133, swap channels and ran one stick of the time. All in all one was bad and the other was stable at rated frequency. Other Thoughts: Looking at the review comments, it seems G.Skill is having QA problem these days with so many DOA or only last short periods. Over the years with all the memory I have brought, this is the only one that failed in service, let alone been a DOA. Returned for refund. We are sorry to hear you had such issues. If using a memory kit not officially designed for the motherboard, make sure to use the latest BIOS as updates can significantly improve compatibility. Due to the nature of DRAM, random defect can occur, but reassured all G.Skill memory modules are backed by a manufacturer lifetime warranty. Any time you feel a module is not working like new, send them in for RMA exchange and we will gladly replace them with ones that will. Visit the G.Skill website for complete RMA procedure. For any questions or concerns, please feel free to contact us directly. Cons: Will not overclock to the advertised 3000MHz with XMP or manually. Overclocked to 28xxMhz stable with the advertised latencies for 3000. Even for C-Bin stuff, thats not great. Motherboard is on the QVL, its just poor quality control on these sticks. But they were pretty cheap, so I won't bother sending back for a refund. Good to hear the memory works well in your system. Each G.Skill memory kit is guaranteed to operate at the rated specifications using a G.Skill QVL certified motherboard and capable CPU. 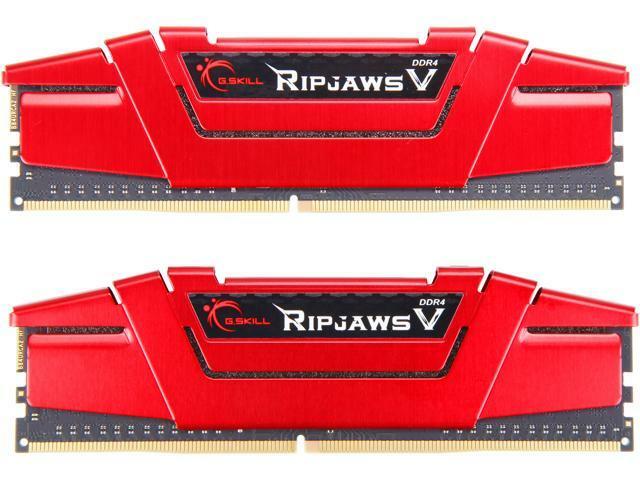 So if you are using a motherboard listed on the G.Skill QVL for this memory kit, you should have no problem reaching DDR4-3000 C16. Check to see if you have the latest BIOS as updates can improve compatibility and OC results. These may not be the best OC modules on the market, but they can still produce outstanding results. For any questions or concerns, please feel free to contact us directly. Pros: Overclocks to 3200 Mhz easily. Let's my Ryzen 5 2600 stretch it's legs. Cons: None it's Gskill after all.